Now celebrating their 60-year anniversary in Branson, the Mabe family has been in the live show business since 1959! Many people visit Branson for the stunning lake views, shopping, exciting attractions and gorgeous hills that the Ozark area is known for. Even though Branson is full of fun and adventure for the whole family, live shows are the backbone of Branson's Entertainment District. The Mabe family began the Baldknobbers Jamboree Show in 1959, which means they are celebrating 60 years in the music business! Through the years they've moved from a rustic lakeside setting to the beautiful Branson Famous Theatre located on MO 165. Playing washboards and banjos on the lakeshore for tourists and locals alike is how the Mabe family entertainment began. 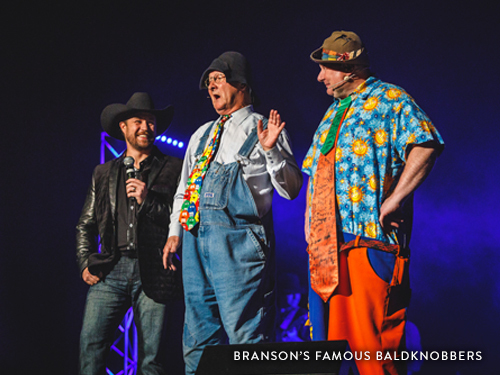 Highlighting Branson’s unique history in every show, the Mabe family made the journey every step of the way with Branson becoming an entertainment destination. With a grassroots beginning, several generations of Mabes have continued the tradition of entertaining. Like its humble beginnings, the show relies on clean comedy, impressive instrumentals, and the cooperation of a family for its success. Hargus Marcel and Droopy Drawers, Jr. are facets of this historical show and make knee-slap-inducing appearances throughout the show. The comedy sketches have been passed down from generation to generation in the Mabe family, providing fun, family-friendly humor for decades. Children and adults alike will laugh out loud at the larger than life antics of these two characters. It is evident that the comedy comes straight from the heart; Hargus and Droopy interact with a lively cast of vocalists and instrumentalists to create a genuinely hilarious act that represents the history of the area. In addition to the funny skits interspersed throughout the show, there are a plethora of high-caliber musical performances that also represent the musical talent that Branson has to offer. A mix of old-time gospel music, classic bluegrass songs, and contemporary country tunes are sung both by incredible soloists and by the group together to provide great music entertainment. Songs such as "Little Rock", "Cowgirls Don't Cry", "Made In America", and "Fiddle In The Band" provide versatile opportunities for the audience to sit back, enjoy, and sing along to. Each branch of the military is also honored with a rousing rendition of all military songs, and any service members in the audience are thanked throughout the performance. In addition to a respect for the armed forces members, the show also features a gospel music segment. The range of music performed throughout the show will appeal to any audience member. Mixed with the humor of Hargus and Droopy, and the collaboration of a talented family and cast, you can't go wrong if you go see this show. Looking for more Branson live shows? Click here to see more shows!